Just started these today: Art Nouveau + poppy pods + Absinthe spoons = Decadence Mittens. Old-timey vices, murky and mysterious. 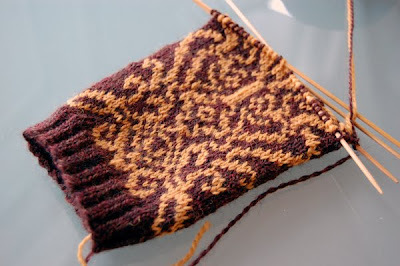 Yes, there's a lot going on on this mitten so far, and not too many places upon which the eye can alight and rest. Tomorrow, hopefully, there will be. All in all, not bad for one afternoon's work. I used to think that Internet radio/podcasts were things that happened to other people, but not to me. It turns out that I just needed to find the right combination of content and personality to get me interested (isn't that always the way?) and wow, is this one amazing. I'd been a fan of Chris Coco's music for quite some time and I am thoroughly smitten with Melodica, his weekly broadcast. The mix he plays is genre-spanning, uncategorizable and entirely brilliant; if you have even a passing interest in acoustic, electronic or downtempo music you really need to give it a listen. It also doesn't hurt that a goodly amount of what he plays is extremely beachy and summery, which is especially nice this time of year. A Canadian winter may be happening outside my door, but mentally I'm on some lovely Ibizan beach, beverage in hand. Melodica is pure bliss to listen (and knit) to. Listen here, on chriscoco.com or here, on mixcloud.com. Oh. Drooool. So I've definitely making these. February 10, 2010 at 5:56 p.m. I'm in love! I must finally conquer colorwork this year! February 10, 2010 at 6:21 p.m.
February 10, 2010 at 6:47 p.m.
February 10, 2010 at 7:25 p.m.
OMG. These are gorgeous. But then again, EVERYTHING you knit is gorgeous. February 10, 2010 at 8:32 p.m.
Those mittens are amazing! I can't wait to see how they progress. February 10, 2010 at 10:09 p.m.
February 11, 2010 at 2:33 a.m.
February 11, 2010 at 8:41 a.m.